If you’ve ever seen an especially cool Flash effect on the web, gone straight to your trusty Flash book to find out how to do it, then turned away empty-handed—Flash Hacks is for you. 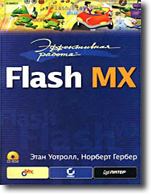 This unique book offers a collection of expert Flash tips and tricks for optimization, creating interesting effects, ActionScript programming, sound and video effects, and much more—and you don’t need to be an expert to use them (although you’ll certainly look like one). With Flash technology, you can create compelling web content, expressive user interfaces, and rich applications for the Internet—all of which dramatically enhance the user experience. 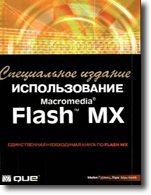 But Flash is not just practical, it’s a wellspring of opportunities to unleash your creativity and have fun. Flash Hacks dives straight into all that’s fun and creative about Flash, while presenting useful programming techniques and practical—although never mundane—hacks that can make your work easier. True to O’Reilly’s popular Hacks series, Flash Hacks tackles problems and solutions that aren’t dealt with elsewhere. You’ll pick up insider tips from the experts, and learn about amazing and sometimes quirky aspects of Flash. 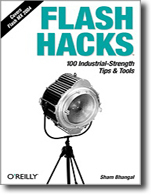 If you want more than your average Flash user—you want to explore and experiment, unearth shortcuts, create useful tools, and come up with fun things to try on your own—Flash Hacks is the book you’ll need.